Welcome to part 2 of my 308 part series - better know a riding. Today, Papineau! 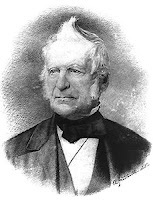 The riding of Papineau is, appropriately enough, named after a political family - Joseph Papineau and his son Louis-Joseph Papineau, famous for his political leadership and trendy hairstyles (pictured here), which would later be mimicked by future Papineau MPs as a tribute to Louis-Joseph. After engaging in protest, politics, and armed rebellion, Papineau helped found le parti rouge, a temporary ad hoc rainbow coalition which initially opposed the Union of Canada but would later sit in a coalition government with the grits in 1858...for less than 1 day, as part of Canada's shortest serving government ever (the government collapsed after Gilles Duceppe changed his mind about running for its leadership). Today, Papineau is Canada's smallest riding and it has the lowest average family income in Canada...which, on the bright side, means the voters there didn't lose a ton of money today. 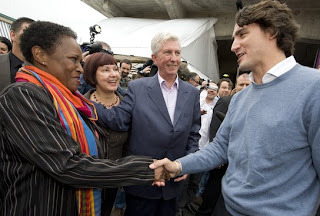 Vivian Barbot (BQ): This 67 year old (pictured above challenging Justin Trudeau to a thumb war) was a busy rookie in the Bloc caucus as Duceppe's intergovernmental affairs minister. Her long and distinguished career began...oh, who am I kidding...OMG JUSTIN TRUDEAU IS RUNNING!!! 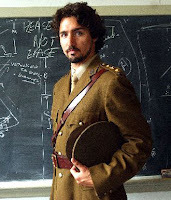 Justin Trudeau (Lib): Trudeau was born Christmas Day 1971 and has been a political star ever since. He burst onto the Liberal Party scene at the last leadership convention when his well time endorsement of Gerard Kennedy catapulted the then third place Kennedy all the way to...fourth place. Since that convention, every single female young Liberal in the country has, at some time or another, had a picture of herself and Justin Trudeau as her facebook profile pic. Trudeau captured the Papineau nomination in April of last year. In 2005, Trudeau married Sophie Gregoire and in 2007 the couple gave birth to their first son, Xavier Trudeau, already considered the frontrunner in the 2054 Liberal leadership race (slogan: "Mark an X for Xavier"). Oh, and he's also got a bit of an acting career on the side, playing yet another Papineau - Talbot Mercer Papineau - in an a CBC mini series. Mustaque Sarker (CPC): Mustaque is looking to lose for the third straight time in Papineau...someone should really tell him that the way to get into the Senate as a Quebec Conservative is not by running for the party repeatedly, but by not running. Costa Zafiropoulos (NDP): Costa seems like a quality candidate, his one weakness being that he is not the son Canada's most famous Prime Minister. Predictions: 79% of you who entered my election pool predicted a Trudeau win in Papineau and I tend to agree with that consensus. It's certainly a riding well tailored for Justin and the kid is a tireless campaigner hell bent on earning his ticket to the show. It's far too early to start talking about Trudeau for leadership but the Liberal caucus in Quebec could certainly use some fresh blood and Trudeau will provide just that. How is Kennedy doing in Parkdale High Park? I would hate to see the guy that should have won the leadership be undone in his first shot at a Federal seat. Plus it would lower your chances of getting in the senate! By Anonymous, at 10:10 a.m. I always thought Trudeau was better suited for a Westmount/Mount Royal type seat than a more working class, blue-collar riding with a higher francophone population like Papineau. I still think he will win but it will be close. Democratic Space has it 38-41 for Justin.ca (TM) and 33-36 for the Bloc, which seems about right to me. By Dr. Leo Spaceman, at 10:17 a.m. Speaking as someone who has lived in this riding for four years now, I can assure you that Justin Trudeau doesn't stand a chance here, no matter how many of you out there in English Canada are infatuated with the man or the legacy of his father. Look at the demographics: 45% of this riding is old-stock Quebecers. Pierre Trudeau, the man who employed the War Measures Act against their cause, is the federalist les québécois most love to hate. Anywhere you go, electoral strategy isn't just about winning people to your cause; it's also about convincing your base to actually get out and vote, and I can't think of anything more likely to bring that 45% out to the polls than the chance to vote against Trudeau. Another 47% of the riding speaks neither English nor French as a mother tongue, and as with first-generation Canadians elsewhere have traditionally voted Liberal; they are the reason Pierre Pettigrew was able to hold this riding as long as he did (although by small margins). But by choosing a well-spoken and respected labour activist who like them arrived here as an adult, the Bloc was able to gain enough support from these new arrivals to take this riding in 2006. If nothing else, Barbot can certainly count on the support of the sizable Haitian community here. So, look for the Bloc to hold this riding by a larger margin than last time. Trudeau would have done better where he lives in Outremont, but apparently he didn't think he was a match for the Québec NDP machine. All of this should be pretty obvious to anyone who follows the local media. For example, if your French is good enough, you'll find this parody of Trudeau's bizarre franglais introductory video pretty funny. By mvc, at 10:45 a.m.
By daveberta, at 10:52 a.m.
Any post that references Pierre Pettigrew's hair is a winner in my books. Justin should do well with the immigrant vote - the Trudeau name is less toxic with them than francophone Quebecers. I would have had it a slam dunk for him, but the recent surge in Bloc support across Quebec will make this one a nail bitter. By CW, at 11:08 a.m.
Just as a follow up to my previous post. Today's CROP-Le Soleil poll shows that Trudeau has a 40-34 lead over Vivian Barbot in Papineau. By Dr. Leo Spaceman, at 11:13 a.m. I can't help but think that Kennedy's bizarre decision to move to Venezuela following the leadership convention has hurt his chances. What's that you say? He didn't move to Venezuela but in fact has been in Canada the whole time? Could have fooled me. My prediction is the Trudeau will win and Kennedy will lose. It's 1980 all over again. By Reality Bites, at 12:15 p.m.
Will there be strategic voting in Papineau by the anti-Trudeau coalition to block a Liberal star? Looking forward to your profiles on the nail-biters in Mont Royal and Fundy Royal. By nuna d. above, at 12:17 p.m.
"How is Kennedy doing in Parkdale High Park?" I was just up there (it is my riding - I plan on voting NDP because I hate Gerard Kennedy), I'd say it looks like a close race judging from the sign war. There is a natural advantage for NDP candidates in Parkdale-High Park, fueled by considerable demographic changes (the riding went from a largely Polish one to a gentrified hipster/yuppie one over the past decade), and elected (and re-elected) probably the most radically left wing provincial NDP MPP (Cheri Di Novo, a reformed former drug dealer/street person turned United Church minister), and is one of the 5 ridings where the MMP referendum passed. Gerard Kennedy isn't the hometown boy some suggest, either. His first riding in Ontario was York South (Bob Rae's former riding - Rae resigned in '96), and he barely won there against David Miller. In P-HP he faced mostly token opposition apart from Annamarie Castrilli in 1999 - she won 30% of the vote as a Tory. The combination of a decent moderate Tory candidate (I don't think Sawczeco fits the bill there) could take away enough votes on GK's right to elect Nash. The Greens are also a possible factor here, they got 10% of the vote in the last provincial election. Also, Kennedy may be a big name, but he is a lousy constituency MP compared to say, Kris Korwin Kucynski (a city councilor), who would win in a walk. Kennedy should have come home and run in Winnipeg South, this might be the only seat outside of Newfoundland that switches from Tory to Liberal this time around. Or he should have run the by-election in London, held a week before the convention. I'm sure he would have passed Dion for third on the first ballot if he had the momentum of being an elected MP and with Dion and Kennedy in different spots....who knows. Be a shame if his political career implodes with another heartbreaking loss after the Ontario leadership, Federal Leadership and a loss to Peggy Nash. I sincerely hope he can win. The Liberal party need a young up and coming left of center MP to take over this morbid bound party. By ManitobaGrit, at 6:02 p.m. I suggest you hit up Haldimand-Norfolk- the most agricultural riding in ONtario, south west of Toronto on Lake Erie. We've got the Hon Diane Finley against Eric Hoskins, the 44 year old co-founder of War Child Canada and the recipient of the Order of Canada and the Lester Pearson peace prize. By Sophie-Marie, at 10:05 p.m.
Gerard Kennedy is a vengeful micromanager. He is a bully and cares more about himself than those he serves. He used provincial money to buy votes for his leadership bid. The package may be good but the contents are not what we need inthis country. By 柯云, at 8:10 p.m.
By hoomans, at 8:12 a.m.
By hoomans, at 8:13 a.m.
By hoomans, at 8:14 a.m.
By Rahul Singh, at 12:50 a.m.
By top level domain, at 10:52 p.m.
By top level domain, at 11:28 p.m.
By top level domain, at 11:29 p.m.
By top level domain, at 11:30 p.m.
By top level domain, at 11:33 p.m.
By top level domain, at 11:34 p.m.
By top level domain, at 11:51 p.m.
By top level domain, at 6:14 a.m.
By top level domain, at 6:15 a.m.
By top level domain, at 6:16 a.m.
By top level domain, at 6:17 a.m.
By top level domain, at 6:18 a.m.
By top level domain, at 6:19 a.m.
By top level domain, at 6:20 a.m.
By top level domain, at 6:21 a.m.
By top level domain, at 6:22 a.m.
By top level domain, at 6:23 a.m.
By top level domain, at 6:25 a.m.
By top level domain, at 6:26 a.m.
By top level domain, at 6:28 a.m.
By top level domain, at 6:30 a.m.
By top level domain, at 6:31 a.m.
By luckys, at 11:06 a.m.
By Pansys Silvaz, at 11:45 p.m.
By Pengobatan Demam Berdarah Baik Untuk Semua Usia, at 11:37 p.m.
By Yaro Gabriel, at 10:29 p.m.
By Anonymous, at 4:11 p.m.
By luckys, at 9:11 a.m.
By corianchromat, at 8:14 a.m.